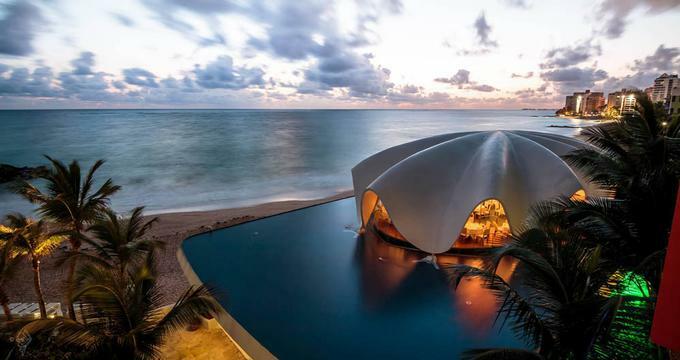 If you've decided to go on a romantic trip to San Juan after reading our article 10 Best Things to Do in San Juan, Puerto Rico, there are many beautiful hotels and inns to choose from that offer spectacular ocean views, spas, pools and great restaurants. Here are the best hotels and places to stay in San Juan. 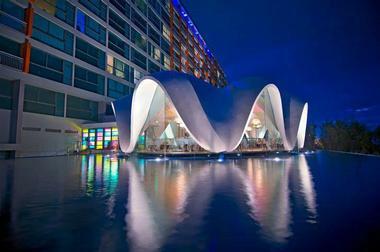 La Concha is a stylish resort on the water's edge in San Juan. Guests can stay in the Ocean Tower or the Suite Tower. 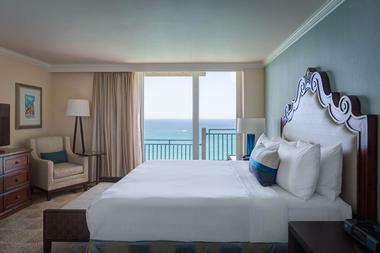 The Ocean Tower features Pool Cabana or Ocean Front guest rooms with double beds or a king bed, junior suites with a king and a sofa bed, and a seating area. You can also choose a one-bedroom suite. The Suite Tower is a more luxurious area with European-style kitchens, expansive baths, and chic furnishings along with an in-room safe, wireless Internet, LCD TVs, and more. Rooms afford guests views of the city or ocean and may include a balcony and a whirlpool. 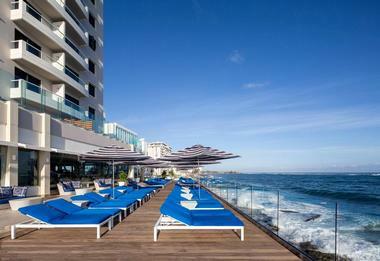 Condado Vanderbilt is designed to give couples an intimate and elegant getaway. The building has been restored and features stunning Spanish Revival architecture. The resort was first built in 1919 but features modern amenities in the rooms and suites. There are 319 rooms plus 107 suites where you can find features like elegant French doors leading to private balconies and terraces that give you excellent views of the Atlantic Ocean. Every room has fast wireless Internet, high-definition screens, Apple TVs, and fine toiletries and linens. The hotel has a beach with chaise lounges and cabanas reserved for guests, complete with butler service, food and beverage service, and towel service. In the Beach Tower, you will find a concierge, a sundeck featuring chaise lounges, and two pools. The Spa Tower boasts an infinity pool, a main pool, and a sundeck. 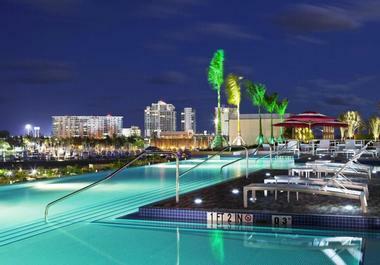 Guests also have access to the Vanderbilt Spa and Fitness Center and the Spa at Condado Vanderbilt. There are VIP packages available with features such as 24-hour butler service. Finally, you can enjoy a delightful meal, snack, or drink at one of the hotel’s seven restaurants, bars, and lounges. 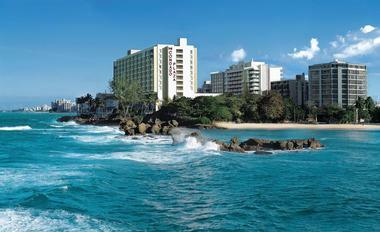 The Condado Plaza Hilton is the only hotel in San Juan that offers views of both Condado Lagoon and the Atlantic Ocean. There are several types of rooms both for couples or other guests to enjoy, including rooms and suites. You can enjoy in-room movies, flat-screen TVs, wireless Internet, workstations with ergonomic chairs, deluxe bath amenities, and in-suite mini-fridges. Guest rooms have private balconies, blackout curtains, hair dryers, coffee makers, and irons. Suites feature a living room area with another cable television and even more spacious bathrooms. You can also get an extra-large suite with a wet bar, a Nespresso coffee machine, a separate entrance, and multiple bedrooms. The resort has its own beach that is tucked away and is perfect for water sports. This historic boutique hotel is the first of its kind in San Juan, and its convenient location appeals to guests looking for a relaxing and romantic getaway. This bed and breakfast in the Spanish style features 25 rooms, each with air conditioning and private baths, telephones, and cable color TVs. You can choose from six different room types, including Premium, Full Standard, Standard King, Standard Queen, Standard Full, or Single Economy. 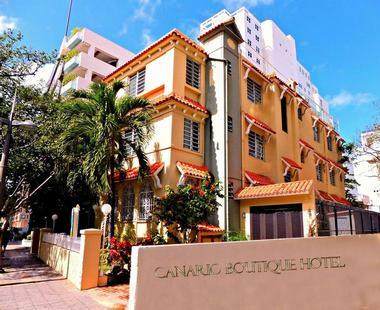 This boutique hotel is just a block away from the beach, and its convenient location right in Condado means you don’t have to walk far to enjoy a variety of evening activities. Rooms include a continental breakfast and the morning newspaper. Guests can borrow beach towels, although there are a limited number available. The hotel can direct you towards places that rent beach chairs or nearby spas and fitness centers. 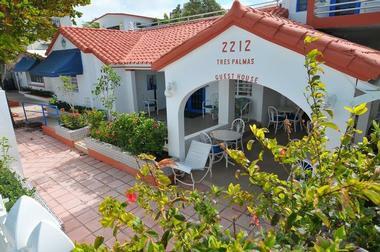 Tres Palmas Inn is a beachfront hotel right in Ocean Park Beach by the major cosmopolitan zones. All rooms have wireless Internet, flat-screen TVs, and iPod docking stations. They also have safes, refrigerators, ceiling fans, and telephones. Some suites also have kitchens, and there is a wheelchair accessible unit. Guests start the day with a complimentary continental breakfast. You can enjoy your meal while taking in beach views, and you’re always welcome to relax in a hammock. There are only twelve steps between the hotel and the ocean. If you prefer, you can go swimming in the private pool in the private courtyard or take advantage of the hot tub and sun deck on the roof for a romantic experience. For other recreational activities, guests can schedule a massage or borrow a bike. There are also barbeque facilities, body boards, and beach chairs available for guests free of charge. Hotel El Convento combines old world elegance and charm with modern luxuries in a boutique hotel that is ideal for honeymoons and electrifying getaways. 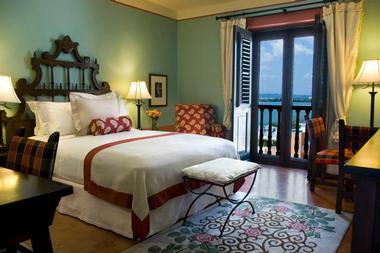 Guests can stay in one of the 58 rooms with handcrafted furniture, Andalusian tile floors, and marble bathrooms. Every room and public area shows off the beautiful architecture. There is wireless Internet throughout the building, and each room has goose-down pillows, plush slippers and bath robes, wireless Internet, Bose radio, cordless phones, irons and ironing boards, hairdryers, refrigerators with complimentary bottled water, an in-room safe, a work desk, and a coffeemaker with Premium Alto Grande coffee. El Convento Beach Club gives guests pool and beach privileges at the sister properties spread along the best beaches in the area. On site, you will find landscaped areas with an herb garden, a fitness center, coin-operated laundry, and a plunge pool. There are three restaurants, so you can enjoy traditional Puerto Rican dishes, Spanish tapas, or something in between at El Picoteo, Pizza e Birra, or Patio del Nispero. Every day, there is a Manager’s Reception on La Veranda Terrace with hors d’oeuvres and wine. The hotel is just a short walk from historic landmarks, nightlife, museums, restaurants, and more. The Dreamcatcher is actually the only vegetarian guesthouse in San Juan, making it perfect for those in search of a romantic getaway that meets their dietary needs. Each of the nine rooms and four apartments in the bed and breakfast has its own unique decorations. Throughout the building, you will find dream catchers and other beautiful artifacts made by Native Americans. Every room has air conditioning, beach towels, bath towels, and cotton sheets along with an iron and hairdryer. Some rooms have their own private baths while others share with up to two other rooms. There is free wireless Internet throughout the property. This luxurious resort is perfect for couples looking for a romantic getaway or families who want to relax. 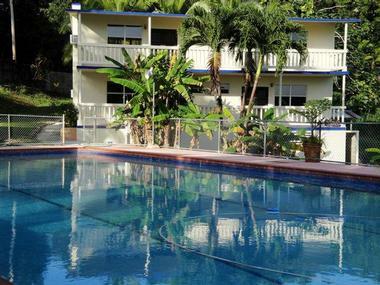 It is only steps away from the beach, offering easy access to water activities and sunbathing. 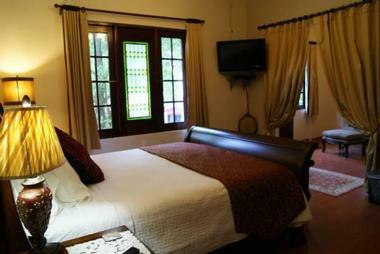 The rooms have high-speed Internet, amazing views, and HD televisions. There are also floor-to-ceiling windows to let you enjoy the views, thick mattress, fluffy pillows, high-end bath products, and mini-fridges. This resort has an outdoor pool, a spa, a whirlpool, a water slide, an arcade room, and a state-of-the-art wellness center. The 14,000 square foot casino with full service is also a major attraction. There are six lounges and restaurants on site, and you can choose from a buffet, full American, continental, grab-n-go, or hot breakfast. Later, have dessert at Gelato & Co, a drink at the Red Coral Lounge, food and drinks at La Vista Latin Grill & Bar, a snack or lunch at La Isla Beach Bar, coffee and light dishes at Coffee Merchants Treats To Go, or Asian cuisine at Wan Chai Noodle Bar. Ciqala Luxury Suites offers multiple types of rooms and suites, all of which have their own private bathrooms, safety deposit box, wireless Internet, HD TV with a DVD player, alarm clock, coffeemaker, microwave, refrigerator, closet, and work desk. The basic room has a queen-sized bed, and some suites also have sleeper sofas, full kitchens, dining areas, jetted tubs in the bathroom, rainfall showers, multiple bedrooms, an extra bathroom featuring a tub, and a laundry room. Take a complimentary shuttle to the beach where you can relax or enjoy cocktails and a rotating menu of Tapas. 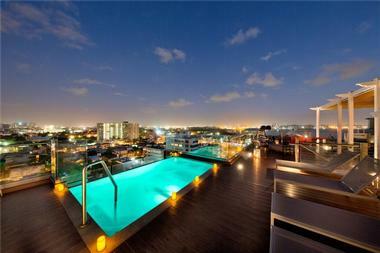 The rooftop offers excellent views of the city, San Juan Bay, and the sunset. The terrace also has a pool. The Rooftop Terrace and Pool Bar provides you with a pleasant atmosphere where enjoy your favorite drinks, including local juices and rums. Breakfast and dinner are also available every day. Walking three minutes from Coqui del Mar will take you to Ocean Park beach. The rooms of this hotel are all apartment-style, allowing you to relax and feel at home during your romantic getaway. The building features art by local artists. Every unit has private full kitchens featuring microwaves, stovetops, ovens, cookware, sinks, fridges, and coffeemakers. All rooms also have private baths and there are in-room safes, hair dryers, and fast wireless Internet. The hotel aims to be as environmentally friendly as possible, which is why you will notice in-shower dispensers for complimentary toiletries instead of small plastic bottles. The rooms also have air conditioners as well as ceiling fans. Different sleeping arrangements vary, and the hotel can accommodate between two, four, six, or eleven adults per apartment. Guests have complimentary access to bicycles, free parking, beach chairs, beach umbrellas, beach towels, and a shared Jacuzzi. 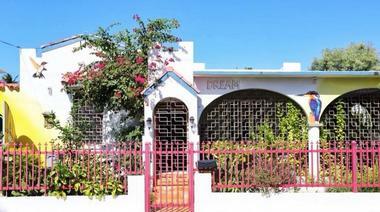 The Coqui del Mar guesthouse is just a block from the beach and ten minutes from the cruise ports and airport. You can take a quick walk to casinos, nightclubs, restaurants, grocery stores, and more. Hacienda Moyano is a unique option for visitors to Puerto Rico as it is tucked away in El Yunque National Forest. It offers a nice, remote location for couples who simply want to relax and enjoy some privacy during their vacation. The hotel offers stunning views of the rainforest and oceans, and it is conveniently located right by the highway for easy access. There are four apartments for guests to stay in, each of which has tile floors, air-conditioning, a full kitchen, and porches in the front and back. Guests also have access to complimentary parking, gardens that are perfect for exploration, and an outdoor pool. The hotel even offers access to the river for some water-based entertainment. Several dogs and cats live on the property, making the hacienda feel more like home. 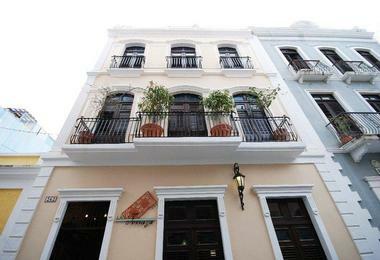 La Terraza De San Juan is right in the heart historic Old San Juan, giving guests easy access to area attractions. The unique property consists of two Spanish colonial buildings from the 19th century with charming rooms and apartment suites. Each room has modern conveniences with Old World charm, including artisanal tile floors, soaring ceilings, and wood doors in the colonial style. There are also irons with ironing boards, hair dryers, private bathrooms, air conditioning, small fridges, iHome clock radios, smart TVs, and free wireless Internet. You can also choose a room with a balcony, satellite TV, a queen or king bed, or one that is handicap accessible. Upon arrival, guests receive locally grown coffee prepared in the vintage espresso machine or fresh infused ice water, and the staff will give you information about the surrounding attractions and hotel. The hotel has a rooftop terrace with beautiful views of historic Old San Juan and San Juan Bay. The terrace is ideal for sunbathing, enjoying an afternoon breeze, taking advantage of the shaded areas, or simply enjoying the views. Ask the staff to borrow a beach towel if you forgot your own and stop by the exciting and popular plunge pool with glass walls. At La Terraza De San Juan, the day begins with a signature breakfast in the lobby or terrace or in your room. The Sheraton Puerto Rico Hotel and Casino in the Convention Center District offers gorgeous views of the San Juan Bay and is just minutes from historic Old San Juan and numerous beaches. The hotel has 503 rooms, which includes 22 suites. Every room and suite has a 40-inch flat panel TV, an iPod entertainment system, an iron, a well-lit and spacious desk, a Sheraton Sweet Sleeper bed, and wireless access. Depending on the room or suite type, you can also enjoy an ADA compliant room, a chaise lounge, private balconies, parlors, a living area, a wet bar, an extra half-bath, a dining table, an in-room fitness center, or a pantry. There is a Club Lounge on the 12th floor with beverages, complimentary breakfast, and hors d’oeuvres for certain rooms. This area also has an open-air deck with gorgeous views. The hotel also has a 24-hour Fitness Facility, cabana rentals, shoeshine service, babysitting service, a gift shop, the casino, a sundeck, and an outdoor heated pool. There is also a concierge desk for assistance finding things to do and making dinner reservations. Enjoy a sit-down meal at Choices or Texas de Brazil, a drink and some tapas at District Bar, or a bite at the Pool Bar & Grille. 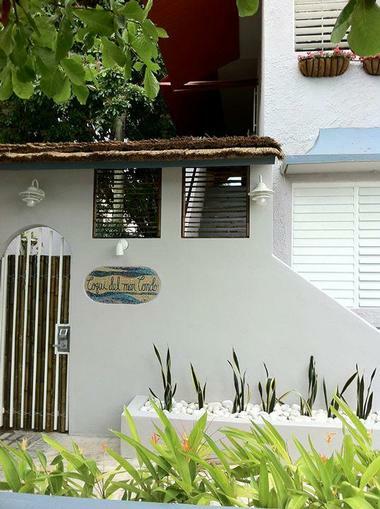 The Casa Castellana B&B Inn is the perfect spot for a couple’s getaway in San Juan. Each room has its own unique décor with names based on poetic cities found in Old Spain. Throughout the property, there are gorgeous stained glass windows, and the building dates back to the 1920s. Rooms have Egyptian cotton bedding, Turkish cotton towels of high-quality, monogrammed guest robes, and flat screen TVs and DVD players. The property also has peaceful terraces perfect for relaxing and daydreaming. Other amenities include a kitchen available for guests, a BBQ grille, an indoor lounge with a TV/DVD player and sofas, meeting areas, a Jacuzzi, and a garden featuring patio seating. The property is just a short walk away from casinos, nightclubs, and the beach, or you can take a quick car ride to the get to the airport or Old San Juan. The day begins with a home-cooked breakfast with family recipes, gourmet local pastries, fresh juice, fresh coffee, and eggs made to order. Guests also have the option of making their own meal in the on-site kitchen. There are also snacks, coffee, and tea available.